This STANLEY® FATMAX® Premium Auto-Retract Squeeze Safety Knife has a pressure-sensitive blade that automatically retracts once disengaged from the cutting surface. It also has a metal body with slip-resistant bi-material grip for durability and control. Easy trigger squeeze technology exposes the blade and helps reduce user strain. **** Plus, with a blade lock to help prevent accidental blade exposure, this is a great cutting solution for corrugate, tape, and more. When working continuously with cutting tools in a fast-paced environment, accidents can happen. You can help reduce the risk of cuts, lacerations, and punctures on the job with the STANLEY® line of safety knives. 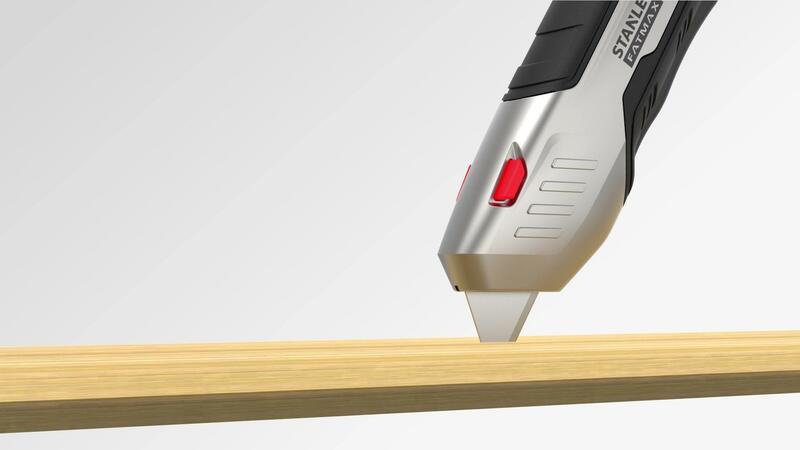 Pressure-sensitive blade automatically retracts once disengaged from cutting surface. Blade lock helps prevent accidental blade exposure. Metal body with slip-resistant bi-material grip for durability and control. Accepts standard round-point utility blades. Lanyard hang hole for easy transportation and storage. ****Compared to a thumb slide.